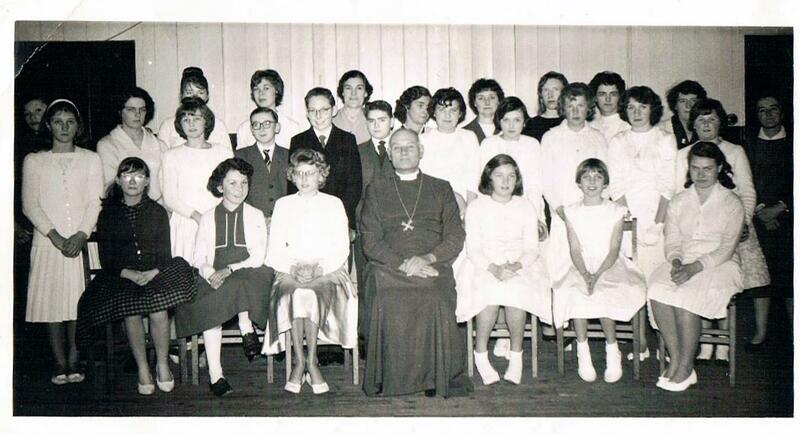 This photo not sure of the date shows Bishop Stuart Smith with confirmation candidates at St John Church Hall Tilbury. My late sister Denise Sutcliffe is middle row third in from left and her friend Margaret Brown front row first on left chair. On the end of the front row on right hand side is Kathleen McQuire,behind her is Jacqueline Jerden.Behind the Bishop is my brother Barry Wakefield to the left of him is Graham Healy.Recognise others but cannot remember names. Hi 2nd row left of bishop next to Barry Wakefield and Paul Johnson. Can not remember photo , remember classes curates Spurrel and Scutter. School blazer for maroon Aveley tech. Before Aveley it was Manorway fond memories of Digby in infants. Enid, yes I do and my father did play cricket regularly on the Daisy Field. I remember the names Enid Brown and Valerie Wakefield from those Manorway says. Liz is now living in Ipswich with her husband – her two grown-up sons are now living away from home with her 3 grandchildren. It all seems so long ago now – I reached 65 earlier this week and I doubt that my daughters (24 and 22) would relate at all to our childhood in Tilbury. Must go back for a look round sometime. Best wishes. Paul, do you have a sister called Elizabeth, and did you live in Gainsborough ave? Elizabeth Johnson was in my class at Manorway school. I was Enid Brown then. Valerie Wakefield was also in our class. If I recall correctly your dad played cricket on the daisy field? By Enid Elizabeth Smith. Have never seen this photo and have absolutely no memory of the event but I am 3rd from left in the second row in the light grey jacket, school tie, big specs and the least cool haircut on the planet (thanks mum and dad). Sandra Phillips was in my class at Manorway and, if I remember correctly, she lived over the fire station. Where am I now? Living in Solihull after having retired from BT where I worked as an accountant and I reach age 65 tomorrow. Still have the specs and the big ears but not the haircut! I am 2nd row far left standing behind Margaret Brown, next to her is Jennifer Beard (I believe) next is Valerie Wakefield, bishop, Sandra Philips and Kathleen? On end first row. Boy behind the bishop is Barry Wakefield.